I doubt I'll ever acquire much more so get anything left that you may need now while you can. 4 Pin Qty: 3 $3 ea. 8 Pin Qty: 13 $2 ea. 8 Pin Qty: 5 / 11 Pin Qty: 11 / $2 ea. but perhaps still what you need. 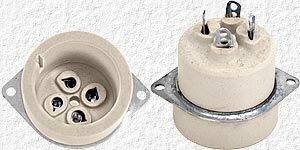 On the right side of the photo are 2 Large Base to Small Base CRT adapter sockets for 9 & 12 pin CRTs. Bottom left is a 9 pin right angle PCB socket (Sold) and to it's right are 2 types of PCB 7 & 9 pin tube sockets, upper left an 8 pin PCB socket and the others are a few other types of vintage hard to find plugs & sockets. Email for further information & costs and, if looking for something specific, please include a photo of the item and I'll see what I can find. 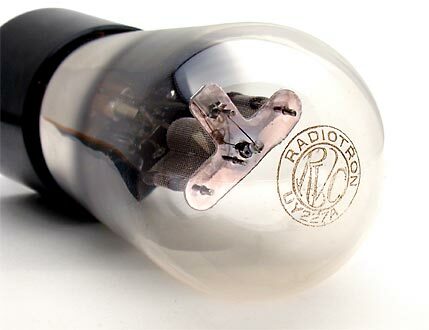 This home brew silver plated tube housing with a built-in plate tuning capacitor has become tarnished, but can be easily cleaned with a little silver cleaner and will save much of the hard work if you plan to build a VHF or UHF amplifier. A 224+ (left) with an engraved base and . . . .
Used in late 20's to early 30's. 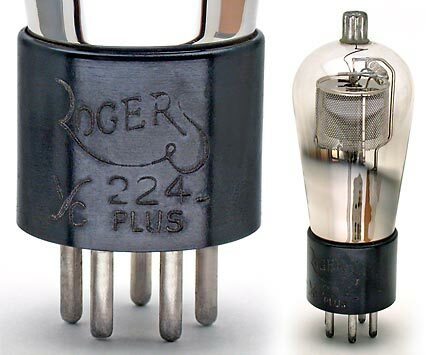 Is the 224PLUS the same as a 224-A, something special, or simply a regular 224 and a labelling trick by Rogers to help sell their 224 tube? that I may have, but not know about.